As the world changes all around us, acquiring technical skills is what brings opportunity and the promise of education is what offers hope. Who will teach and nurture these world changers of tomorrow, these global problem solvers? Together with education, instructor training and employment partners Cisco has made a commitment to developing the workforce of the future. Through the Cisco Networking Academy Program, more than 50,000 students in Thailand have been trained since 1999 with more than 50 academies across the country. Miss Suthinee Leelahemaratana is currently Program Manager for Cisco Networking Academy in Thailand for more than 4 years and has been working with educators, NGO, and social enterprise across Thailand. She is now working with Cisco National Engagement Strategy Program, which helps to create the Skilled-Workforce to feed in to industry partnering with the Ministry of Digital Economy and Society. 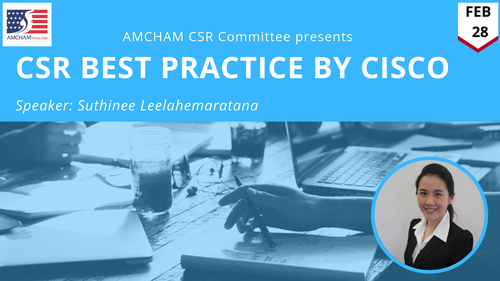 Join us to hear her share the story of Cisco's CSR initiatives in Thailand. This cost is including light lunch, coffee, tea, water and soft drinks.